Fiction – hardcover; Bloomsbury; 320 pages; 2013. Review copy courtesy of the publisher. The land masses of Ireland and North America might be separated by the Atlantic Ocean but their histories are strongly linked. Colum McCann explores those connections in his latest novel, TransAtlantic, which was longlisted for last year’s Man Booker Prize and shortlisted for this year’s Kerry Group Irish Novel of the Year award (to be announced on 28 May). The book comprises three main narrative threads at key times in Ireland’s history. The first tells the story of the first non-stop transatlantic aeroplane flight in 1919 by British aviators John Alcock and Arthur Brown, which landed in a peat bog in County Galway; the second focuses on African-American Frederick Douglass, a former slave turned leader of the abolitionist movement, who visits Ireland for a speaking tour just as the Great Famine begins to take a hold; and the third examines the work of Senator George Mitchell, an American politician, who played a pivotal role in the Northern Ireland Peace Process, specifically the 1998 Good Friday Agreement. Linking all these real life characters are three generations of fictional women from the same family: Lily Duggan, the Dublin maid who looks after Frederick Douglass; her daughter, Emily Ehrlich, a Newfoundland reporter who covers the Alcock-Brown flight; and Emily’s daughter, Lottie, who emigrates to Northern Ireland, where she lives a rather privileged life. Combined, the narrative threads span more than 150 years — from 1845 to 2011 — and while there are connections between the storylines and the characters, these are largely superfluous. In many ways, each thread could be read as a standalone story, but McCann chops them up and interleaves them so that the novel, as a whole, occasionally jumps backwards and forwards in time, while the locations — Dublin, New York, Belfast — also shift. This results in a hugely ambitious novel which shows how — as one character puts it — “the tunnels of our lives connect, coming to daylight at the oddest moments, and then plunge us into the dark again”. McCann has done this kind of multi-layered narrative before. His last novel, Let the Great World Spin, which I reviewed in 2009, focused on a diverse range of characters living in New York at the time Philippe Petit walked a tightrope between the Twin Towers in 1974. In many ways it read like a collection of short stories and didn’t feel cohesive enough to be a novel (but what would I know — it ended up winning the National Book Award and the Dublin IMPAC International Literary Award). Perhaps the same could be argued here, but TransAtlantic, just as ambitious in structure and style, is more polished (by which I mean the links between the narrative threads are less obvious) and it reads like a novel — and a properly entertaining and absorbing one at that. Indeed, I’d have a hard time picking out my favourite storyline because I so enjoyed each one — and there was never a moment when I thought, I wish he’d hurry up with this thread so I can get to the next one, which is sometimes a risk when an author dabbles in multiple narratives. It certainly helps that McCann is a virtuoso when it comes to combining real lives with imagined ones. And he’s a master at historical detail, of conjuring just the right atmosphere and mood, so that you feel as if you are right there with the people he’s writing about, whether they lived 20 years ago or 100 years ago. Even his prose — and the dialogue — reflects the time period in which each storyline is set: for instance, more formal for the 19th century narrative, a little bit more relaxed and contemporary for the early 21st century narrative. This all adds up to an accomplished, intricately crafted novel. It’s also a hugely moving one — I laughed at certain scenes and wanted to cry at others — and the opening section, which details that record-breaking transatlantic flight, is some of the most exciting and nail-biting fiction I’ve ever read. While the rest of this rather grand, sweeping novel might not be quite as tense, it’s brimful of passion and pain, hope and humour, love and loss. 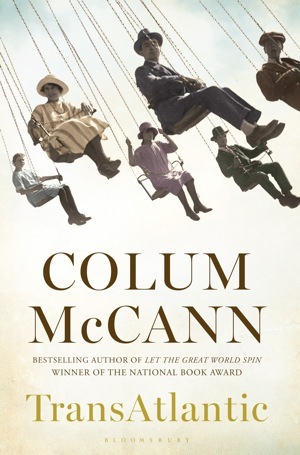 In striving for impossible goals — whether it be transatlantic flight, abolition of slavery or finding peace after 30 years of violence — McCann’s characters, firmly rooted to the past, show us how we should always look to the future. So, will I risk Transatlantic? Maybe if I stumble on it at the library! I walked past this book at on of our book outlets and this is the second really positive review I’ve read since. I’ll have to go back and see if it’s still there because I now want to read it. Yes, go back and dig it out, Sharkell! I was pleasantly surprised by how much I enjoyed this one. I think you would like the mix of historical detail and fiction in this one, Lisa. There are lots of recurring themes here, mainly about war and striving to find peace, but also in daring to try impossible things, such as air flight and abolition of slavery. Theres also a thread about the suffrage movement which I enjoyed. I haven’t been reading ‘new’ books for a while, but I should read this one. I loved ‘Let the Great World Spin’ as did my book club. It was a popular pick. I think I’m reluctant to read this one because it’s true historical fiction, yes. By that I mean something set outside the living memory of its author and his audience. I’m not a big fan of historical fiction. Well, the history about the Peace Process isnt out of the living memory of most of us. I still recall the sheer delight when the Good Friday Agreement came to pass, and at the time I was living in a completely different hemisphere! In fact, I loved this section of the novel because he brought a new perspective to it…I hadnt quite clocked at the time that it was an American senator who was one of the prime negotiators. Im not a massive fan of historical fiction either, but I really loved this one, perhaps because it was so firmly rooted in fact. I have this one on my ereader and it sounds like something that suits my mood and my need to read non-cosy Irish fiction. I’m glad you enjoyed it, too! The mix of history and fiction was so skillfully done. At my book club, it turned out some of us got confused about who was real and who was only real in fiction.